Why do some people respond to an aerobic workout routine by becoming incredibly fit, whereas others who exercise just as hard for months end up no fitter than when they began? That question has bedeviled countless people who’ve started exercise programs. 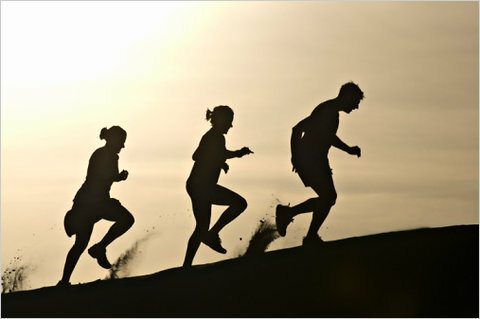 It has also motivated a major new study of the genetics of fitness. Scientists long have known that when any given group of people faithfully follows the same aerobic workout routine, some increase their cardiorespiratory fitness substantially, while an unfortunate few seem to get no benefits at all. But what, beyond the fundamental unfairness of life, makes one person’s body receptive to exercise and another’s resistant? According to the new study, which will soon be published in The Journal of Applied Physiology, part of the answer may depend on the state of specific genes. For the study, researchers from the Pennington Biomedical Research Center in Baton Rouge, La., and other institutions examined the genomes of 473 healthy white volunteers. All were part of the Heritage Family Study, an ongoing (and multiethnic) examination of exercise genetics that already has provided reams of epidemiological information about whether various exercise traits tend to run in families. (It turns out that many do, including the basic drive to exercise at all.) But neither the Heritage Study nor any other experiment to date had identified the specific genes that might be associated with a person’s physical response to exercise. The new study is what’s known as a genomewide association study, generally considered the gold standard of genetic science, and it’s the first study of this type to look at any aspect of exercise. It brings “exercise genetic research” into “the genomics era,” an accompanying editorial states. In such studies, researchers examine virtually the entire genome of people with various traits, often diseases. The aim is to discern whether tiny segments of DNA called single-nucleotide polymorphisms, or SNPs (pronounced “snips”), recur frequently in those with the traits. The presence of particular SNPs suggests that a particular snippet of the genome affects susceptibility to a disease or, in this case, exercise. The researchers looked at 324,611 individual snippets over all. Each of the volunteers had already completed a carefully supervised five-month exercise program, during which participants pedaled stationary bicycles three times a week, at controlled and identical intensities. Some wound up much fitter, as determined by the increase in the amount of oxygen their bodies consumed during intense exercise, a measure called maximal oxygen capacity, or VO2 max. In others, VO2 max had barely budged. No obvious, consistent differences in age, gender, body mass or commitment marked those who responded well and those who continued to huff and struggle during their workouts, even after five months. But there was a divergence in their genomes. The researchers identified 21 specific SNPs, out of the more than 300,000 examined, that differed consistently between the two groups. SNPs come in pairs, since each of us receives one paternal copy and one maternal copy. So there were 42 different individual versions of the 21 SNPs. Those exercisers who had 19 or more of these SNPs improved their cardiorespiratory fitness three times as much as those who had nine or fewer. One SNP in particular, located on a gene known as ACSL1, seemed especially potent, possibly accounting for as much as 6 percent of the difference in response among people, a high percentage by the standards of genomewide association studies. This gene already has been shown to play a role in how the body metabolizes fats, which might partly explain why it also affects exercise response. But, said Claude Bouchard, who holds the John W. Barton Sr. Endowed Chair in Genetics and Nutrition at Pennington and was lead author of the study, “far more research is needed before we can say” just how any particular gene influences the body’s response to aerobic exercise, let alone what additional genes might be involved in that response. “There are bound to be” others, Dr. Bouchard said. There also may be differences based on ethnicity. When he tried to replicate his findings in a subset of African-American participants in the Heritage Study, only a few of the 21 SNPs played a role in that group’s exercise response. Still, the findings, preliminary or not, raise several intriguing concerns. How, for one, can any of us tell if we harbor the ideal SNPs for a robust aerobic response to endurance exercise? And if it turns out that we don’t carry those advantageous snippets of genes, can we take to the couch, since our fitness levels won’t budge much even if we dutifully pedal or run? “It will be years, if ever,” said Dr. Bouchard, before gene tests exist that can reliably separate high and low responders. Even if and when such tests become available, he continued, the results will not constitute an excuse for skipping workouts. “There are countless other benefits provided by exercise,” he said, apart from whether it raises your VO2 max. “Exercise can reduce blood pressure and improve lipid profiles,” he said. It can better your health, even if, by certain measures, it does not render you more aerobically fit. More fundamentally, Dr. Bouchard said, elements of the interplay of genetics, environment, the human body and resolve probably always will remain mysterious and stubbornly individualized, no matter how much science disentangles the genome. People who don’t have an ideal version of the ACSL1 gene to prompt aerobic improvements from exercise, for instance, might harbor a different, unidentified gene that just makes exercise feel enjoyable, regardless. So, too, might someone whose body is genetically predisposed not to respond aerobically to running blossom during weight training sessions.